a good single grain, with typical notes, but significantly more powerful and mature than expected. clear vanilla, some glue, slightly fruity. Sweet about what a single grain should be like. sweet, but with amazing spiciness from the wood, strong. slightly tart, sparkling, somewhat fruity, lots of wood and menthol. 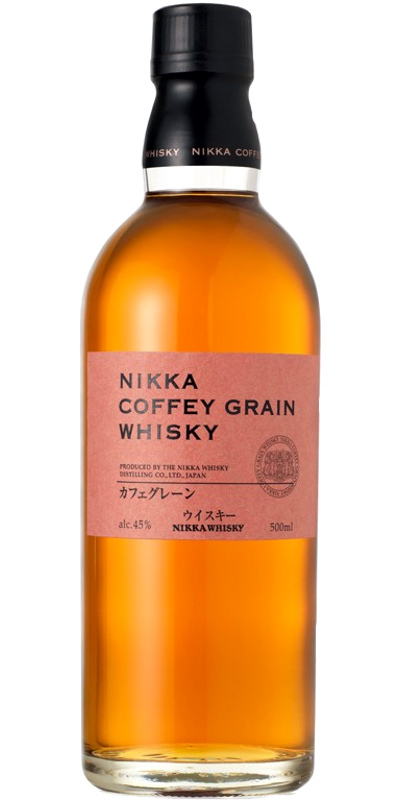 Nikka Coffey Grain is quite a reasonable young whisky, but it’s still a touch underdone in places. There’s some enjoyable freshness and fruitiness in places, but it’s all too brief and not particularly complicated either. By no means flawed, but for personal taste I’d take the Coffey Malt every single day of the week. Grains and solvents. Oily corns and grains join toffee and caramel and vanilla in a fairly delicate and not hugely expressive nose (the Coffey Malt has a lot more oomph to it). There’s quite a strong vein of varnish and solvent running through this one – it’s not unpleasant (unless you’re a recovering glue-sniffing addict), but does solidify the relative youth of this whisky. Fruits are presents, but a little non-descript – mangos and bananas possible, but yellow-fruits is a more apt descriptor. Delicate and light. Immediate rawness and solvent is tempered by some more pleasant fresh corns, vanilla and caramel. There’s earthiness here – mushrooms and some light butteriness that provides a modicum of texture. Spicing is greater here than on the nose – pepper in particular. Short and with oak and underlying earthiness. Neutral enough to start as a starter! almonds, a little "rum", a minty side, undifferentiated fruits. Grain that comes from Miyagikyo’s two Coffey stills, originally imported from Scotland to Japan in 1963. N: Sugary sweet straight-bourbon grain [made predominantly from corn so that makes sense], with a fungal & nutty side from youthful wood. Theres a slightly floral sweet-pea fragrance with simple yet desirable sugars opening out. Remarkably well-tempered vanilla, in fact a quite the masterclass in getting the best from young spirit & from young casks. T: Sweet & prickly with honeyed/vanilla wood spices [wood chips? ], then a dry, oily & wood-nuttiness – much like the nose. After a slightly reticent arrival, theres a noticeable intense dip into a Sauternes-sweet sour. Best with a little water. F: The finish especially highlights the realities of this being a young grain in youthful wood. Finishes on light [single] creamy vanilla and a super-controlled slight aniseed/pepper heat. Both Yoichi and Miyagikyo single malts are distilled in traditional pot stills, but the company Nikka also has several column stills as well, called Coffey stills. Those are used to create both grain and single malt whisky. Nikka has bottled these as Coffey Grain and Coffey Malt. Let us put these head-to-head, starting with the grain. The nose is very sweet on vanilla, toffee and all kinds of sugar, but it also has a chemical side. Think wood glue or varnish. It is not disturbing, but does stand out. In the background I find a hint of bitter oranges, but just a hint. Good body. Very oily and soft on the spices. Reminds me a bit of bourbon now. Honeysweet again with mostly vanilla and toffee, but also some raw sugar. The hint of oranges returns and is joined by some coconut. The spiciness increases and even becomes quite dominant. The finish is not very long, but does remain spicy and sweet. So this is the in-house grain, distilled in a column still, that is used in the famous Nikka blends, such as the Super Rare and Super Revival. Around 55 EUR, just like the Coffey Malt. Nose little powerful (alcohol level). Sweet on vanilla, marshmallow and candy. Gourmand but not too much. Alcohol well integrated. Pastry mouth on vanilla, honey and toffee. A brioche side very pleasant. Then the cereals make their appearance. A long buttered and spicy finish.